A photo of this cap made the rounds in cyberspace not long after the 2016 presidential election. 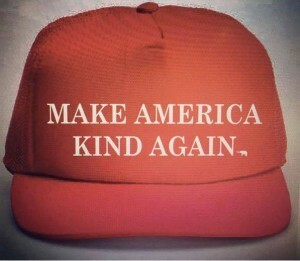 “Make America Kind Again” was the plea. The campaign to be “great again” evidently resonated with enough voters in enough states that the Electoral College was tipped against the popular vote. So now we have what we have here in America – I would say: neither greatness nor goodness. A Pandora’s Box of ugliness has been opened in our society. Of course people have always been unkind to one another but just a few years ago, regular Americans seemed to have better manners. There was a common civility that helped us navigate our personal opinions so that – at least in public – we mostly treated acquaintances and strangers with a basic politeness. That began to fall apart with accusations of “political correctness” so that saying things in such a way as not to offend others was perceived as a censure on MY ability to say whatever I wanted. MY rights were more important than any one else’s feelings. Circumspection and kindness in our conversation were ridiculed as a weakness. During the eight years that America had its first mixed race president, unkindness accelerated. Criticisms of any president’s politics and policies are nothing new, but somehow too many Americans grew more comfortable believing and repeating rampant ugly untruths about this particular first family. America’s shadow side of racism came boldly into the light. Now, with our current president’s life long habit of disrespect and derision, even more Americans have lost a habit of common public civility. My blogger friend, Egberto Willies, records incidents of ugliness he ascribes to the “Trump Effect.” The Southern Poverty Law Center tracks hate crimes and acts of ugliness; their HateWatch project documents an alarming increase since 2016. I believe this. I believe human nature bends towards love more than it does toward hate. So how do we help each other re-learn how to love? How do we unlearn hate? How do we reclaim kindness? Baby steps, I will say. Small but courageous acts of goodness. Living as examples of kindness in the face of public ugliness. I think there are many of our fellow Americans who truly want to make America both great and good, and I believe these two values are completely compatible. Actually, they are more than compatible; these values must go hand in hand. These baby steps, this endurance and persistence in the face of our current climate of unkindness must become more and more outspoken if we are to make America both great and good. Those of us who share this vision realize that might does NOT make right. And we recognize that this vision of great goodness has adversaries both on the Right and on the Left. That is why we must be diligent to call out corrosive, abusive unkindness wherever we see it. Yes, things are going backwards right now but the pendulum will swing again. 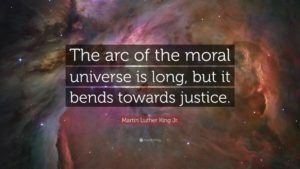 The arc of the universe will keep bending towards justice. The light will keep shining in the darkness and the darkness will not overcome it. Love comes more naturally to the human heart, let’s remember that truth. Let’s see it as our North Star.